It’s amazing how some writers just sit there, sit there and sit there and then you discover them, but really they’ve been they’re along. That’s my experience with Frank Hinton this week. I can’t fully reconstruct it, but I think I saw our very own Roxane Gay mention Hinton (of Metazen fame) in the HTMLG comments as part of what she was reading. Then I saw something else positive about Hinton’s new book, “I Don’t Respect Female Expression.” So I went over to Safety Third Enterprises and downloaded the ebook and noticed its release date. February. The book was released in February? February! For realz? So after downloading and paying the very reasonable $3 tag for it, I happened to look in my downloads. And saw another folder called “I Don’t Respect Female Expression.” Downloaded in March. March? March! For realz? I’d been sitting on this the whole time? Now I’m finally reading it. Just about this time, Stephen Tully does it up this week on the aforementioned HTMLG. There you go. 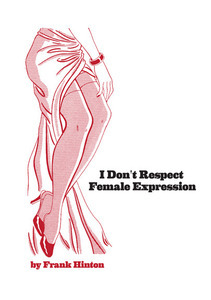 “I Don’t Respect Female Expression” is well worth your time. And your money. Twice even.